MORE DYNAMICS, SAME LOUDNESS YOUR MUSIC, THE WAY YOU INTENDED (4/6) PREVIOUS | NEXT How should we consider dynamics? With recent updates to playout loudness levels, the main platforms now only differ by 3 LU between the loudest and the softest. Clearly there is no benefit in mixing louder than the loudest platform (at which point all platforms will be turning down your audio). But how should we consider dynamics? A song can be dynamic in various different ways, but in terms of loudness it might be useful to consider “micro” dynamics and “macro” dynamics. This article discusses the former. Micro dynamics are the defined at the sample level - very rapid changes in level that provide detail, punch and clarity to a sound, often referred to as transients. In music production it is common to use compressors and limiters to control the transients, evening them out, reducing peaks, and raising the overall loudness of a track. But when major streaming services use loudness normalisation, it doesn’t make sense to over-compress, because your track will not be any louder once it reaches the listener. The more dynamics there are on a micro level, the higher the peaks will be when your track is normalised for streaming. So rather than creating a “loud” master via heavy compression, it makes more sense to keep as much transient detail as possible. 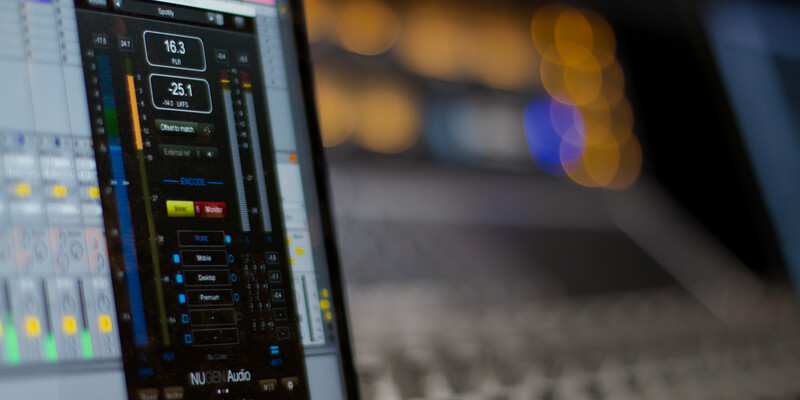 In order to take advantage of this, you could try to avoid over-compressing your drum bus, or ease off your mastering limiter a little to let the transients come through. You can literally view micro dynamics in action by zooming into the waveform of your mixdown and examining how clearly you can see the pulse of the track. The image above shows two versions of the same track, both normalised to the same integrated loudness. The first version is heavily compressed, the second version isn't. Overall loudness or maximum peak level? Of course, this is an artistic decision rather than an imperative, but a piece of music which is dynamic on a micro scale might appear to “pop” more when played alongside other loudness normalised tracks. The overall loudness will be more or less the same, but the maximum peak level can work out significantly higher. This can often be seen at play when modern remasters of classic albums are added to Spotify. If a track has been heavily compressed for a modern CD remaster, narrowing the dynamics on a micro scale, then less of the headroom is utilised. Once normalised for streaming, there is no perceived loudness gained, only dynamics lost. For example, the original 1983 master of ZZ Top’s ‘Sharp Dressed Man’ measures at -10.6 LUFS and peaks at +0.2 dBTP, whereas the much louder 2008 remaster measures at -7.9 LUFS and peaks at +0.6 dBTP. When normalised to Spotify’s current loudness target of -14 LUFS, these peak at -3.2 dBTP and -5.5dBTP respectively. For the streaming listener, neither master is louder than the other overall, but the remaster has a far narrower dynamic range and uses 2.3 dB less of the available headroom. Clearly both versions were produced before streaming became a major concern for mastering engineers, but the implications are clear. How should we consider dynamics? With recent updates to playout loudness levels, the main platforms now only differ by 3 LU between the loudest and the softest. Clearly there is no benefit in mixing louder than the loudest platform (at which point all platforms will be turning down your audio). But how should we consider dynamics? A song can be dynamic in various different ways, but in terms of loudness it might be useful to consider “micro” dynamics and “macro” dynamics. This article discusses the former. Micro dynamics are the defined at the sample level - very rapid changes in level that provide detail, punch and clarity to a sound, often referred to as transients. In music production it is common to use compressors and limiters to control the transients, evening them out, reducing peaks, and raising the overall loudness of a track. But when major streaming services use loudness normalisation, it doesn’t make sense to over-compress, because your track will not be any louder once it reaches the listener. The more dynamics there are on a micro level, the higher the peaks will be when your track is normalised for streaming. So rather than creating a “loud” master via heavy compression, it makes more sense to keep as much transient detail as possible. In order to take advantage of this, you could try to avoid over-compressing your drum bus, or ease off your mastering limiter a little to let the transients come through. You can literally view micro dynamics in action by zooming into the waveform of your mixdown and examining how clearly you can see the pulse of the track. The image above shows two versions of the same track, both normalised to the same integrated loudness. The first version is heavily compressed, the second version isn't. Overall loudness or maximum peak level? Of course, this is an artistic decision rather than an imperative, but a piece of music which is dynamic on a micro scale might appear to “pop” more when played alongside other loudness normalised tracks. The overall loudness will be more or less the same, but the maximum peak level can work out significantly higher. This can often be seen at play when modern remasters of classic albums are added to Spotify. If a track has been heavily compressed for a modern CD remaster, narrowing the dynamics on a micro scale, then less of the headroom is utilised. Once normalised for streaming, there is no perceived loudness gained, only dynamics lost. For example, the original 1983 master of ZZ Top’s ‘Sharp Dressed Man’ measures at -10.6 LUFS and peaks at +0.2 dBTP, whereas the much louder 2008 remaster measures at -7.9 LUFS and peaks at +0.6 dBTP. When normalised to Spotify’s current loudness target of -14 LUFS, these peak at -3.2 dBTP and -5.5dBTP respectively. For the streaming listener, neither master is louder than the other overall, but the remaster has a far narrower dynamic range and uses 2.3 dB less of the available headroom. Clearly both versions were produced before streaming became a major concern for mastering engineers, but the implications are clear. If you want to ensure your track sounds just as great after loudness normalisation as it sounds in your DAW, try the new Modern Mastering bundle today and see the difference it makes.